Salt is so abundant in our daily lives that it is hard to imagine a time when salt was worth as much as gold in weight. In history, Roman soldiers were even sometimes paid in salt, thus giving us the word “salary” and the phrase “worth their salt.” Empires have been built around salt and wars have been fought because of salt. Today’s salt is different than the salt of antiquity. Here are some interesting facts about salt, its health effects, and which salt you should be using in your diet. Millions of years ago, there were huge salty oceans located on areas of the earth which are now land. When these seas dried up, they left behind salt deposits which can be 50 feet in thickness. The initial method of salt production involved miners actually digging and going into the earth to retrieve these salt deposits. As technology improved, miners instead pumped water into the ground, let the salt dissolve, and then pumped out the salty water which would be evaporated to reveal the salt crystals. Today, the more common method of salt production is to extract it from oceans and lakes. Salt crystals are actually grown in closed-off bodies of water. Then the water is evaporated, usually by the sun. Picture of a salt production facility. The water gets its bright colors from salt-loving algae. Most of the salt which is produced in the world is used for industrial purposes, such as making detergents or producing paper. This salt is crude and does not look like the fine, pure-white salt which we typically find in supermarkets. It is usually a brownish color due to the trace elements it contains. Ironically, it is these nutritious trace elements which are removed in the production of table salt. In its natural state, salt contains trace elements like potassium and magnesium – both of which are conveniently needed to help the body process sodium. But, manufacturers strip salt of these trace elements during processing in order to produce a fine, white product. They also will typically add an anti-caking agent to prevent the salt from clumping as it absorbs moisture from the air. The human body needs salt to function. However, it only needs a tiny amount of about 1.5 grams per day. The Upper Intake Level (UL) for salt in the US is 5.8 mg for adults. According the Institute of Medicine, more than 95% of American men and 75% of American women exceed this limit. Consuming too much salt on a regular basis can lead to health problems, most notably high blood pressure. Combine this problem with the obesity epidemic which is spreading throughout the US, and you’ve got a recipe for heart disease. Unprocessed salt contains various trace elements from its source, including varying levels of iodine. Iodine is crucial for thyroid function, and thus our metabolism and protein synthesis. In an effort to combat the iodine deficiency problem which was rampant in the 19th century, governments began to add iodine to salt. In the US, this began in the 1920s. Now, iodized salt is the de-facto salt found in most Western supermarkets. Public health initiatives are causing iodized salt to become commonplace in developing countries as well. While iodine is crucial for health, there is some worry that people may be getting too much iodine because of this forced-supplementation through iodized salt. However, the human is highly tolerant of iodine, which is why it is used in many medical applications like X-rays. 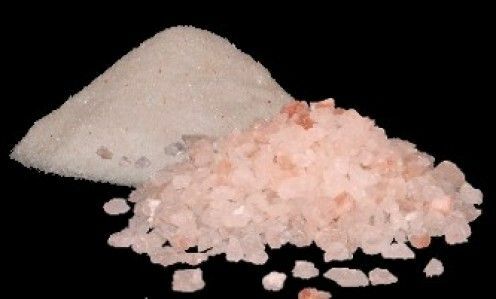 Because most westerns are now getting their salt from processed foods (which are high in salt, but that salt is not iodized), many people may actually be at risk of iodine deficiency. Numerous studies have shown that vegetarians and vegans are particularly at risk of iodine deficiency because iodine is not readily available from plant sources. Starting about a decade ago, “culinary” salts began to gain popularity. Famous cooks started to taut the superior tastes of mineral salts like Himalayan salt or Fleur de Sol from France. Health advocates also touted the benefits of these salts because, being unprocessed, they still contained the nutritious trace elements needed by the human body. While mineral salts certainly are a healthier alternative to refined table salt, it doesn’t necessarily mean that the salts are healthy. Many of these mineral salts (which happen to be very pricey!) do not list any information about their mineral content, nor have they had their mineral compositions inspected. Don’t assume that you will be able to meet your RDAs for iodine, magnesium, or other elements just by adding some fancy mineral salt to your food! Likewise, sea salt often gets touted as being superior to table salt. All “sea salt” means is that the salt came from evaporated sea water. Most of it still gets refined (hence its pure white color) and has additives (which is why it doesn’t clump). Even unrefined sea salt isn’t likely to have a high concentration of elements. In particular, sea salt is generally a very poor source of iodine. One report puts the iodine content of sea salt at just 64 mcg per kilo. Keep in mind that the RDA for iodine in adults is 150 mcg! I am a salty-foods freak. Salt does wonders for some veggies, transforming them by enhancing their flavors. But, it goes without saying that most of us are getting too much salt (even us health-conscious vegetarians). One assessment even found that the sodium intake of vegetarians in industrialized countries was similar to that of omnivores! Based on these facts, it is pretty clear that we’ve got to stop eating so much processed foods if we want to keep our salt in check! As for salt during cooking, here is one easy tip to reduce the amount you feel compelled to add: use a lot of herbs and spices instead. The smorgasbord of flavors will satisfy your taste buds so you won’t need to add as much salt.